Our Presidential offerings include signed letters, documents and political ephemera that give insight into the lives of those that have governed the United States. It may also include items from those that did not quite make it to the highest ranking position, but were integral in supporting the administrations of our past and present Presidents. 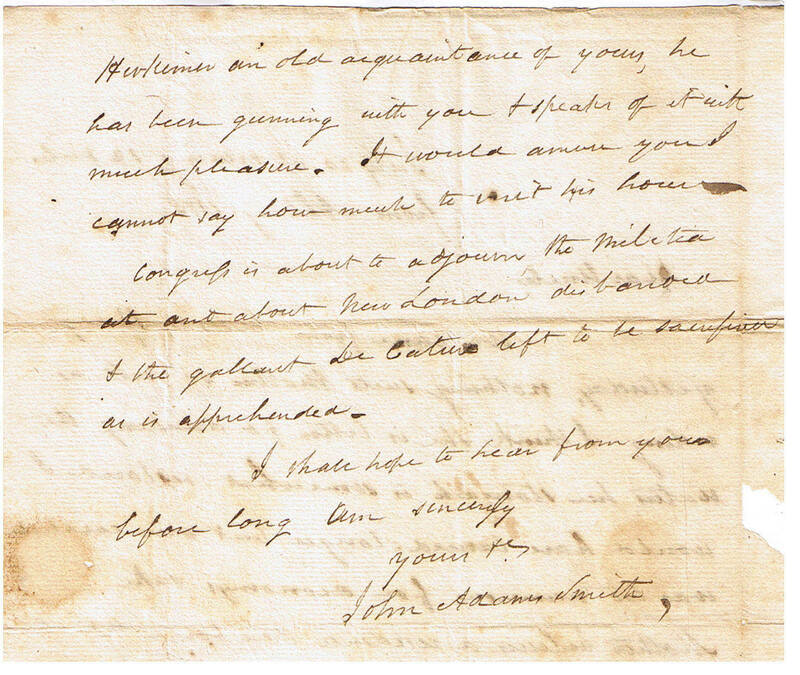 This is a wonderful original letter, dated July 20, 1813, where John Adams Smith has written to his uncle Justus B. Smith regarding the health of his mother, Abigail (Nabby) Smith. Stopping by the waters at Ballston Springs has helped her greatly, but he is anxious to arrive in Quincy, (Massachusetts). Congress is about to adjourn and the militia at New London is disbanded ...signed John Adams Smith. 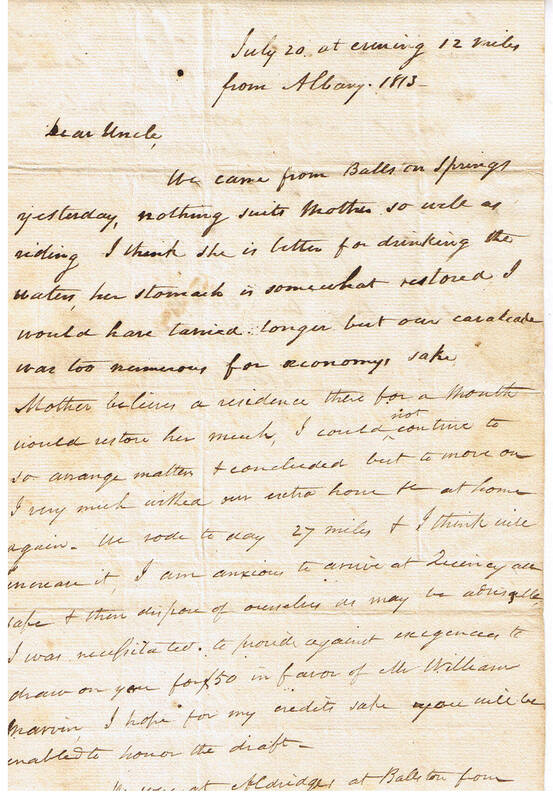 His mother, Nabby Adams Smith would die only three weeks after this letter was written. Letter is two pages, with addressed outer leaf, in overall very good condition. Abigail "Nabby" Adams Smith (July 14, 1765 – August 15, 1813) was the firstborn of Abigail and John Adams, founding father and second President of the United States. Congressman William Smith was introduced to Abigail Adams, John Adam's oldest daughter. They married in 1786 and returned to America in 1788. They had four children together, starting in 1787. The last three were born in New York. Smith kept a large parcel of land along the Chenango River in the Madison County ,New York. He left his brother Justus, who lived nearby, in charge of dividing and selling the remainder of the land. William Smith, Abigail and their family moved to Lebanon in 1807 . They lived in the area known as Smith’s Valley. After their return, Abigail was diagnosed with breast cancer. She returned to her family home in Braintree, Mass., and died there in 1813. Shortly before Abigail’s death, William was elected to the Thirteenth Congress and served two years before being disqualified in 1815. He then returned to Smith’s Valley and passed away a year later in 1816. He is buried with his brother at the Lines Hill Cemetery in Chenango County. 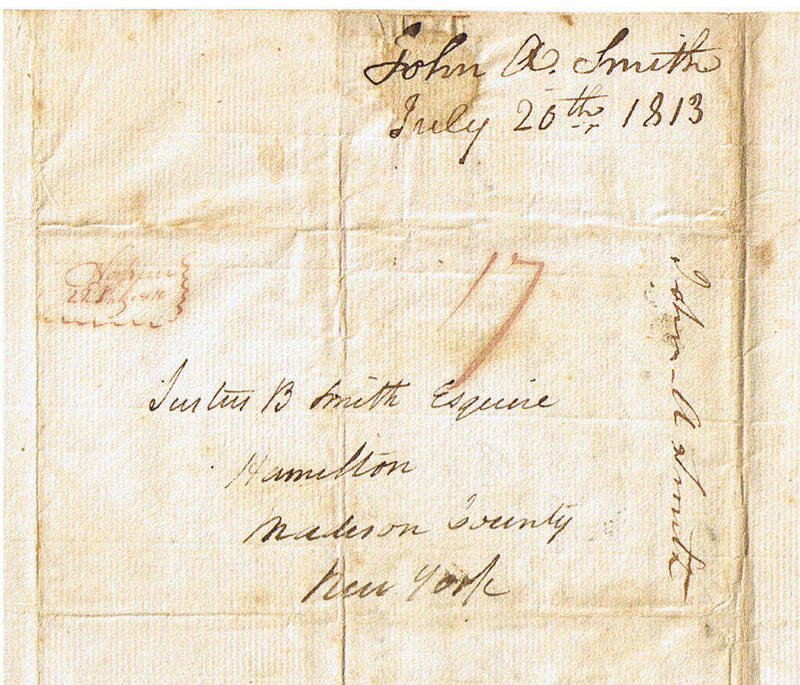 After their deaths, one of their sons, John Adams Smith practiced law in the village of Hamilton in Madison County. 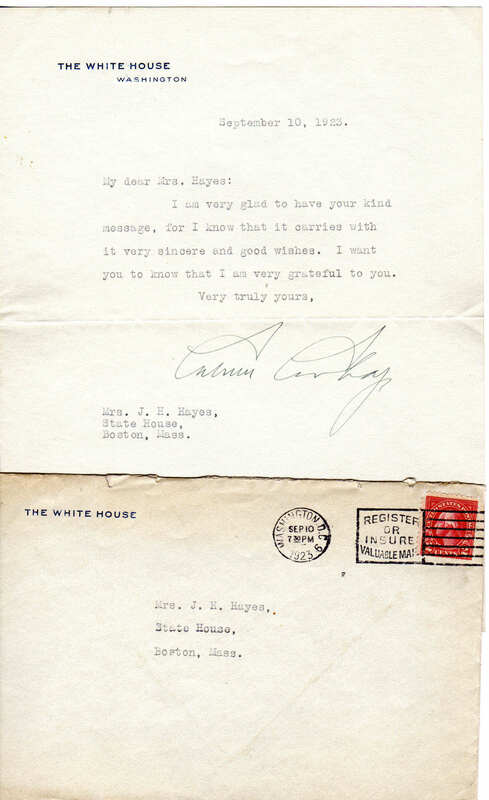 This is a wonderful, original letter dated 1923, where President Calvin Coolidge has signed a letter to Mrs. J.H.Hayes, thanking her for her kind message.On White House letterhead, 8x11, with original emvelope, overall good condition. 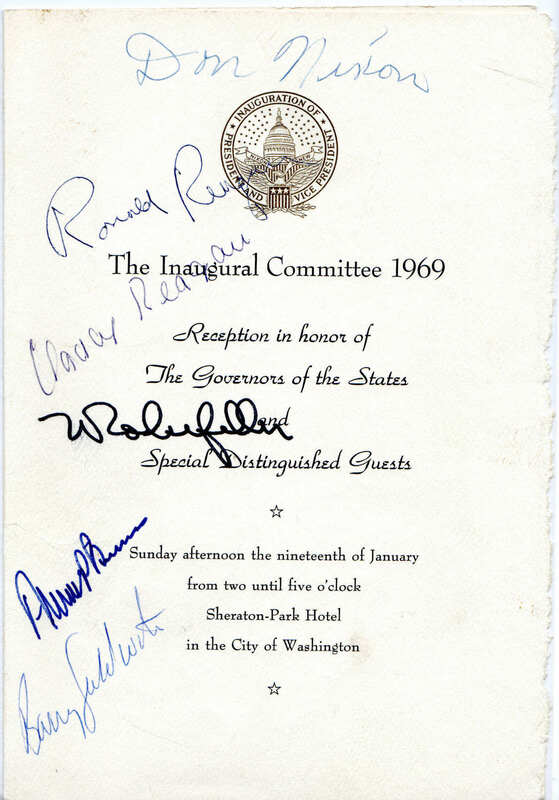 This is a wonderful, original program, dated 1969, an inaugural event for new Governors. Signed by Ronald and Nancy Reagan, Don Nixon, Nelson Rockefeller, Barry Goldwater and one other. Program is 8x10, three pages, overall fine shape.